Apparently Brody Jenner is "Hollywood's Most Eligible Bachelor" or at least that's what it says in the advertisement for his guest appearance at The Estate this Saturday, January 26th. I'm not much of a reality tv person, so I haven't seen any of the shows that he was in, but according to wikipedia, he appeared in "The Hills" and "Keeping Up With The Kardashians." Go (here) to purchase your tickets for the event. I'm impressed with Estate, they must be spending some significant $ to get Hollywood folks to make appearances. Paris Hilton is going to be there as well in a few weeks. I'll post more on that later. 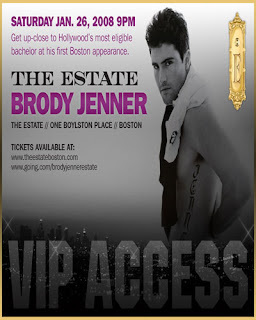 0 Response to "Brody Jenner in Boston @ Estate - 1/26"